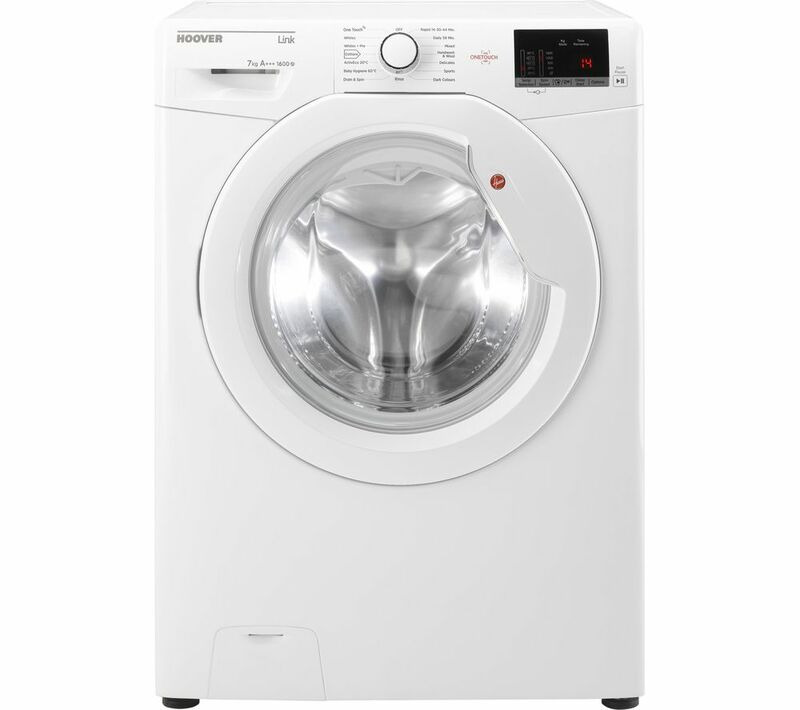 Overview & specs of Hoover DHL 1672D3 NFC 7 kg 1600 Spin Washing Machine by Currys PC World. Top features: - Large wash capacity lets you wash more at once - Smart washing machine that you can control from your phone using NFC - Intelligent Wash System for a deeper, cleaner wash - A+++ energy rating ensures reduces electricity costs and improved efficiency Large wash capacity The Hoover DHL 1672D3 NFC 7 kg 1600 Spin Washing Machine lets you clean up to 35 shirts or seven large bath towels in one wash. A handy All-In-One setting lets you wash different colours and fabrics in the same load, and it takes just 59 minutes. Smart washing machine One touch control lets you pair your NFC-enabled Android smartphone or tablet with the washing machine - just like a contactless payment system. Then you can use the Hoover Wizard app to control the machine. Activate Remote Wash Programs, take advantage of Voice Assist and enjoy the convenience of Auto Clean and Filter Clean features. Intelligent Wash System The washing machine uses highly advanced sensors to constantly monitor and adjust the wash process throughout the cycle, giving you a better wash every time. KG mode saves energy by weighing the laundry then adjusting the cycle time, water and electricity consumption to suit the size of the load. A+++ cuts electricity costs and improves efficiency With an A+++ energy rating, your washing machine saves electricity, works more efficiently and has a reduced environmental impact. A maximum spin speed of 1400 rpm reduces drying time by removing more water. The extra-large porthole makes loading and emptying the machine easy, with a stylish large chrome door with integrated that's simple to open and close. We are comparing prices for Hoover DHL 1672D3 NFC 7 kg 1600 Spin Washing Machine in new condition sold by Currys Pc World, Electrical Discount Uk.